I’ve seen both versions, and until recently I actually had been unaware that there was a 2001 version until I saw it appear in one of my Netflix recommendation reels. I’m a sucker for sports movies, especially football—Rudy (1993) is one of my favorite sports movies of all time. I’ll admit, I think it has a lot to do with the whole underdog element that is practically staple to the genre. Normally I’m not really a fan of movies that are reboots/remakes/sequels, but every once in a while I find that there are exceptions. The 2001 version of Brian’s Song is one such exception. I am not incredibly familiar with Brian Piccolo’s real story, so I can’t say for sure how accurate either version of the movie actually is, but the 2001 version definitely tugged harder at my emotions. While I did find the 1971 version of this movie to be sad, and I did cry during that one as well, the 2001 version had me pretty drenched in tears from a certain point of the movie right up until the very end. Needless to say when I finished watching it, I was totally worn out. If you’re looking for a tear-jerker, this would probably be a good one to try. For the most part, the 2001 version pretty much follows the same pattern as the 1971 version. Aside from the fact that the 1971 version clearly looks and feels dated, and probably might seem extra corny unless you prefer the way films were done in the “old days,” the key difference here is character development. Looking back at the 1971 version after having watched this one, the 1971 version might seem a bit rushed and less detailed. In fact, some of the scenes might seem abrupt in transition and the interactions between characters not as genuine. I think the 2001 version also did a better job with the progression of Piccolo’s disease—whereas the 1971 version had Piccolo suddenly *bam,* he’s sick, the 2001 version has him coughing from pretty much the beginning. So when we learn he actually is sick, it doesn’t seem too out of the blue. Again, I’m not in expert knowledge of Piccolo’s life, so I don’t know how accurately the progression of his disease was depicted, but there was a point where I wondered if the filmmakers strayed a bit from the actual story and overly intensified Piccolo’s disease in the movie just to pull more strongly at people’s emotional strings—of course that could just be my general skepticism talking. I’m always fairly skeptical of movies that claim to be based on a “true story.” I always end up wondering how much of the facts the filmmakers actually bothered to even use. 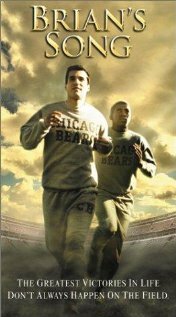 My rating on this entry is not on Brian Piccolo’s actual life story, but on the movie and how it presented his story. Hopefully that makes sense. If you’re looking for a happy ending, you won’t necessarily find it here. (Some people might also interpret the way they chose to end the movie as pretty cheesy, but if my memory serves me correctly, the 1971 version ended in a similar fashion, so they may have just been trying to go for a parallel there.) While I personally enjoyed this movie, as sad as it was, for the very reason that it is a pretty emotionally taxing movie I probably wouldn’t watch it again anytime soon. I’m not completely averse to ever watching it again, I just won’t be eagerly reaching for this unless I’m in a melancholy mood and looking for something that fits that mood. Both versions are worth at least a one-time viewing, so if you haven’t seen either yet, I recommend them.